It’s been more than 20 years since General Motors Design started using 3D rapid prototype technology. Much has changed since then, as both GM Design and the 3D printing technology have gone a long way to becoming the thing of the future. Today, customers and suppliers view General Motors as a leader and innovator in North America and as a beta tester for the latest equipment and software. 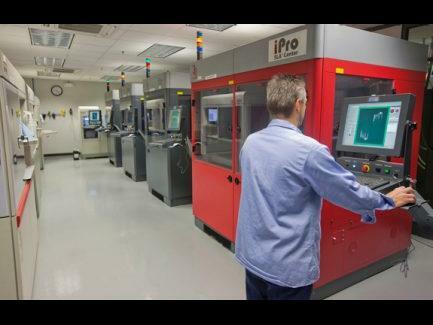 According to the article on GE’s official website, the Rapid Prototype Laboratory, which is part of GM Design, employs a team of 15 elite technicians who generate over 20,000 parts each year. The digital designs for any part on a truck or a car are directly transferred to the Lab where technicians then generate 3D printed parts in a matter of hours. The technicians of GM Design use two different methodologies for producing prototype parts, albeit both processes build parts in layers from mathematical data. Each of the processes possesses characteristics the technician considers for the type of part being made and its final application. The first process is called Selective Laser Sintering (SLS) and it uses a laser to scan a pattern of powered plastic material and then fuses it together. The second process is called Stereo Lithography Apparatus (SLA) and it uses a liquid resin that the lasers cure into a solid as they scan. In the SLS process, the unused powder supports each part during fabrication and is later brushed off. For the SLA manufacturing process, technicians add a custom lattice structure to the bottom of the vat, as the resin will not support the parts being formed. After the parts are made, the technicians remove the lattice support by hand. GM engineers use it to reduce tooling costs and understand designs prior to final release for variety of parts and systems. Manufacturing uses it to streamline its processes in the plant for early builds, GM designers use it for quick iteration of exterior and interior parts component assemblies, while GM Aerodynamicists use it to devise solutions that deliver fuel economy and components that impact the air flow like side mirrors, rocker and rear quarter panels. The technology enables quick iteration of parts with no tooling, which results in greater creativity, flexibility, speed and accuracy form which manufacturing facilities save both money and time.